Jake LaMotta made a follow-up book to his autobiography Raging Bull entitled Raging Bull II. I’ve heard rumors that Martin Scorsese had once though of making a sequel to Raging Bull, but decided not to do it. Well, someone else did. Instead of getting Robert DeNiro to play LaMotta, William Forsythe of Boardwalk Empire is playing him. Also in the cast are Cloris Leachman, Penelope Ann Miller, Joe Mantagne, Tom Sizemore, and Paul Sorvina. Now before saying anything, this is clearly a bad idea. Raging Bull is one of the most praised films of all time that’s on most Best Films lists. Making a sequel would be an insult to the original film. If you don’t believe me, look at the Jaws series. The original is one of the greatest films of all time. Then the sequels were made. It was a bad idea to just do the same story again, and without Spielberg’s direction the series bombed. I can see that the sequel might work if Martin Scorsese or Robert DeNiro got involved. But without them, it would just be a flavorless film. But MGM is doing everything in their power to prevent this sequel from being made. Not because they don’t want to see a follow-up that will most likely disappoint fans of the original, but because they claimed they have the rights to LaMotta’s novel. Yes, it’s a sad world Hollywood’s coming to. These producers should be ashamed of taking Martin Scorsese’s timeless classic and making a sequel of it. « Editor’s Note: Today We Celebrate Our Independence Day! And it doesn’t even make sense from a financial standpoint. Raging Bull was over 30 years ago. And its not like its a famous pop culture movie like Rocky was, its an old black and white art film that hardly no one under 21 has seen. Its not going to make any money. Why is this happening? It just confuses me. Raging Bull actually flopped in theaters when it originally came out, but it has gained massive praise and has gained many fans. 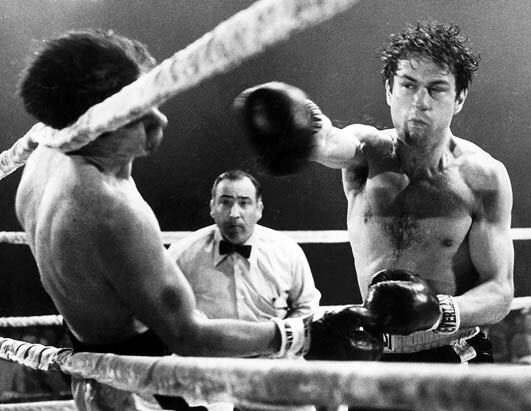 The problem is I’m not sure if fans would want to see a sequel to Raging Bull seeing how perfect the original is. A Raging Bull prequel/sequel is such a bad idea! I hope it never happens. The people behind must have little respect to the Martin Scorsese classic. I hope this film never gets made.